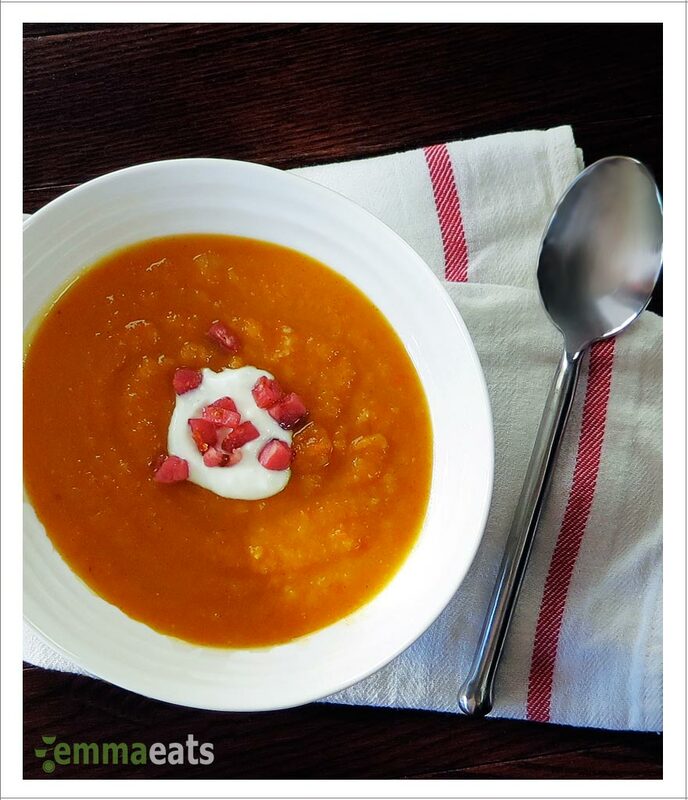 Sweet Potato and Carrot Soup, 2 ways | EmmaEats…and Katie too! We’re in the thick of it now. Winter. Absolutely-frigid-toes-frozen-huddled-under-a-blanket winter. In my last post on fudge, foregoing all extravagances cold turkey as part of a New Year’s resolution was excessive. Moderation is the key and this sweet potato and carrot soup tastes indulgent, but really isn’t. G and I have been eating versions of this for years. My old favourite is made with butternut squash. After enjoying this version a few times, it’s climbed into top spot. It’s straight-forward and simple to prepare. It’s a wonderful way to have a warm and comforting yet healthy and light meal when it’s cold and blowy and icy outside. As many parents quickly come to realize, just because a dish is something you adore doesn’t mean your kids will be remotely interested in it. Mine seem to be off of butternut squash currently. But, fortunately, the sweetness of carrots and sweet potatoes is loved by all. Pair it with a grilled tomato and bacon sandwich or more simply with some crusty fresh bread. Yum! Add some maple syrup and cinnamon to the soup and it’s irresistible. Easy as pie — and with maple syrup and cinnamon, it tastes like it too! In a large saucepan, heat the olive oil on medium-high heat. Add the pancetta and fry it until lightly golden. Add the onions and continue to fry them until they have softened. Add the carrots, parsnips and sweet potato and fry for another minute or so. Pour 3 cups of broth into the pot and bring to a boil. Reduce the heat to medium-low and simmer, covered, for 15-20 minutes. Carefully puree the soup and add up to 1/2 cup of warmed broth into the mixture until you reach your desired consistency. If using the maple syrup and cinnamon, stir it in. Ladle the soup into warmed bowls and top with sour cream or Greek yogurt and a sprinkle of crisply fried pancetta if desired. Skip the sour cream or yogurt garnish for a totally dairy-free soup. If you have the time, roasting the sweet potato, carrots and parsnip before pureeing them in the soup offers an exquisite depth of flavour. While the veggies are roasting, fry the pancetta and onions, then add the roasted vegetables and broth, puree, season and serve. I use a hand blender directly in the pot to puree the vegetables but you can also use a blender. Carefully transfer the soup in batches into a blender and puree away.